CASH or CONVENTIONAL ONLY. 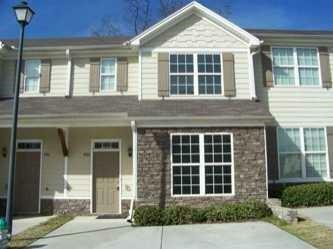 Beautiful townhouse, in gated community, w/new hardwood flooring, carpet, light & plumbing fixtures. Interior is freshly painted & ready for your interior design. Cozy corner fireplace in great room w/views from kitchen & dining areas. Theres a half bath on the main across from large office, living room, or possibly a third bedroom w/French doors. Huge master with large walk-in closet with space for a dresser. Master bath has soaker tub/shower combo. Large second bedroom with private bath. One of the largest units in the community.